In the year 2005, while I was 20 years old, I tattooed on my back the word "'woman" in a mirror text. It has taken me 4 years to be completely satisfied with the word and its meaning, in order to carry it for the rest of my life. The second time I was deal with my tattoo was during my BA Graphic Design studies. I had to take a group's portrait that have anything in common. it was the first time I ask my self if there any more crazy people like me that make Hebrew tattoo over them self? I find the decision of making this kind of tattoo is more complete than an image tattoo. We instinctively analyze the meaning of tattoos while providing criticism over the person who carries them. 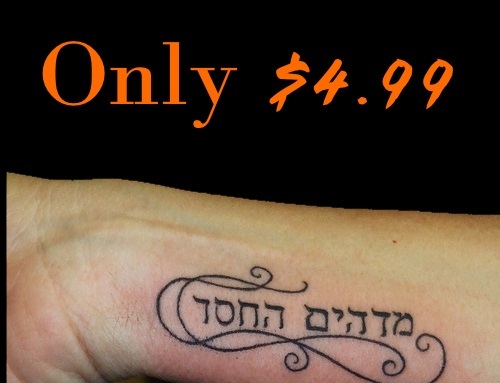 Therefore the searching of those people that carry Hebrew text tattoo reveals personal stories. Stories of why and where the tattoo is. Stories of people.